These Black and White Photographs of Fireflies Will Mesmerize You #arttuesday « Adafruit Industries – Makers, hackers, artists, designers and engineers! Fireflies, which is now showing at Wave Hill in the Bronx, is a collection of photographs from Gregory Crewdson. The photos evoke the eternal heat and quiet of summer nights; Crewdson uses the subtle light of the fireflies to emphasize the vast darkness, via hyperallergic. With the Fireflies series, Gregory Crewdson frames that fleeting moment when the sun slips away and the beguiling insects begin their electric dance. From one image to the next there is a multiplicity of movement, a sense of the unexpected and the uncanny. The intensity of light is generated from the riveting insects, balanced by the waning sun. Moving into total darkness, the landscape fades away and lightening bugs become the focal point. Light is a pivotal element in Crewdson’s large oeuvre and is masterfully controlled and scripted in other series such as Twilight or Dream House. Yet here he launches us into a balmy summer evening by capturing the fireflies’ spontaneous sparkle. In its simplicity and directness, this series is a departure from the large-scale photographs for which Crewdson is known. It was created in 1996, when Crewdson was living alone in his family’s cabin in Becket, Massachusetts. 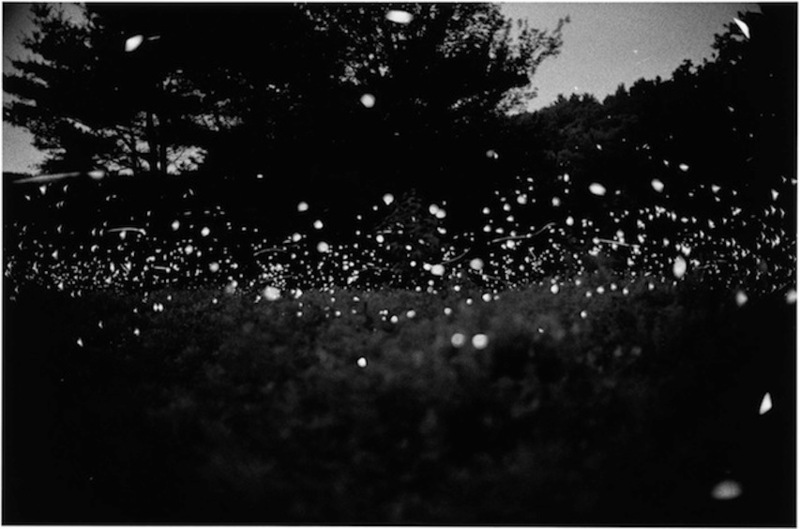 That summer, he ventured out each evening with camera in hand to observe the fireflies’ mysterious mating ritual. At the end of August, he moved on to other projects. Ten years later, he revisited the series with renewed interest, and began to print a total of 61 images. A selection of the black-and-white prints was exhibited in 2006 with a limited-edition catalogue. This is the first time the entire Fireflies series has been shown all together.